Manchester United bowed out of the Champions League after being humbled by Spanish giants Barcelona at the Nou Camp. The English side failed to turn the tie after a 0-1 first leg defeat at home and could not stamp their mark on the tie despite creating clear cut chances during a dominating opening 10 minutes as they fell to a 3-0 defeat at the Nou Camp. Ole Gunnar Solskjaer has a lot to ponder on, as his team now have additional pressure on them to make the top four and qualify for next season's UCL. United created chances but was not clinical in front of the goal as Alexis Sanchez, Mctominay and Rashford all missed viable chances to turn the tie. Barcelona, on the other hand, were at their devastating best with Lionel Messi scoring a brace and Phillipe Coutinho adding the icing on the cake with a sweet strike of his own. United might be a more profitable club than Barcelona when it comes to net worth but the stark contrast between the clubs on the pitch in terms of quality does not bode well for the club and must have set off alarm bells in the boardroom. Solskjaer has done a brilliant job in stabilising a sinking squad but, as the manager said during his post-match press conference, It would take years of rebuilding for United to reach Barcelona's level. The club's only two world-class players in Paul Pogba and David De Gea looked subdued in front of a loaded Barcelona Squad. The fixture showed that United are in for a huge summer as the gaping holes in the squad need to be fixed in order for them to compete with the best in the world. Ole Gunnar Solskjaer went into the tie with fond memories of winning the 1999 UCL title despite being underdogs at the Nou Camp against a very strong Bayern Munich team and, expected his squad to play with the same fearlessness his squad did 20 years ago. The first ten minutes reflected the spirit of both the club and manager as United took the game to their formidable foes and created two clear cut chances. A casual mistake by Ashley Young minutes later proved to be decisive as Lionel Messi made United pay and showed the world yet again why consistency on the big stage is what matters rather than pedigree. Jose Mourinho might have been wrong about a lot of things during his reign as the Manager but, one thing he hit the bullseye with was United's need for elite defenders. Ashley Young's dismal performance, reiterated this fact, as the converted left back laboured in defence and was unable to provide Anthony Martial with any support. Selling Young and Valencia while trying to recruit new full backs should be a top priority for the club. Ole's style of playing sees his full backs push high up the pitch to support players like Lingard and Martial who then have the room to cut in and create chances and having wing backs who are slow and predictable, does not help on either side of the pitch. Despite having two potential world class fullbacks in Diogo Dalot and Luke Shaw United should take a leaf out of Juventus' playbook and look at experienced full backs to compliment their young stars if they are not able to land star names in their prime. 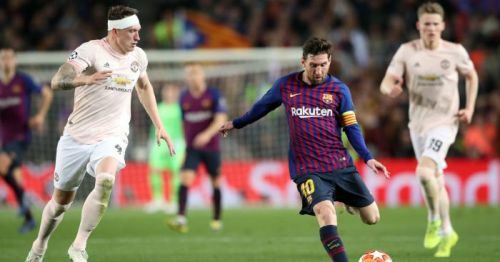 United's defensive struggles were summed up in a singular moment when Messi had Phil Jones dancing to his tune as he wove circles around the former Blackburn defender. United needed Paul Pogba to take the reigns of the game and stamp his authority in order to progress and despite a few magical moments and a brilliant pass to put Rashford through on goal, the French midfielder looked subdued in front of the guile and grit of Rakitic and Busquets. A lot has been discussed about the massive differences in his performances for club and country and how to get the best out of him by surrounding him with the right players. Ole has been getting the most out of him off late but, Pogba still disappears when United need him the most against the biggest clubs, and that comes down to the man himself and not the manager nor the club. The club can do their best to surround him with the right pieces this summer but it's up to Pogba to live up to his billing as he is arguably the best midfielder in world football on his day. United could have done everything possible to stop Messi but on a day the little genius decides to take over there is very little a team can do even if they have an elite defence. We are blessed to live in a generation where we witness greatness on a consistent level as a 5 '7" human being despite his diminutive stature dominates every blade of grass on the pitch and performs miraculous feats on a nightly basis. Lionel Messi once again proved to be the difference and reminded United fans of the UCL finals in 2009, as he danced and weaved his way past the helpless United defenders. Messi, like fine wine, seems to be getting better as he ages as he added yet another brace which takes his goal tally to 45 goals in 42 games. Apart from Cristiano Ronaldo, not a single player has come close to replicating what the tiny genius does consistently and with Ronaldo's Juventus out of the Champions League, Messi has a good chance to guide Barcelona to yet another UCL title with their last triumph coming in 2015. If United are looking to bridge the gap between them and other top clubs like Barcelona and Manchester City, hiring a Technical Director to oversee aspects like recruitment and development of players. Ed Woodward despite all his business acumen, does not have the pedigree to make football decisions. United can look towards clubs like Ajax, Man City and Juventus to discern the impact of appointing a technical director. Edwin van der Sar, Tixi Bergstein and Fabio Paratici have each played a vital role in establishing a structure in terms of recruitment for the continued success of their clubs which United currently lack. Van der Sar has done a brilliant job with the Ajax academy which has unearthed gems like 19-year-old captain Matthijs de Ligt and 21-year-old Barcelona bound midfielder Frenkie de Jong despite losing young stars to other top clubs on a consistent basis.